Flying Eagle/ Standing Liberty Quarter with 2 eras of each-pennies and dimes. Lincoln Wheat Penny, Indian Head Penny, Mercury Dime, and Roosevelt Dime. Austrian Lead Crystal in your choice of color. This coin jewelry bracelet can be made from your coins for $78. 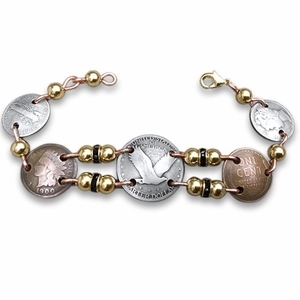 This handcrafted coin jewelry bracelet is made in the USA.